We only use Medjool dates from California. Medjool dates are the sweetest and moistest of dates, and they also have the best flavor. Dates are high in soluble fiber which supports healthy digestion by drawing fluid into the digestive tract. They’re a rich source of minerals like copper, manganese, magnesium, and potassium that support bone health. 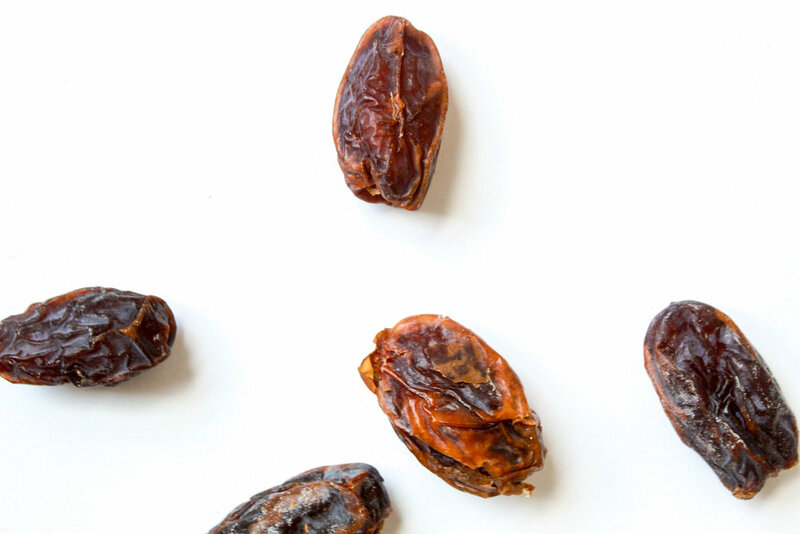 Our dates are a great source of energy … and are perfectly sweet. We hand-roast all of our own nuts, using no oil or salt, to achieve maximum freshness and flavor. None of our nuts are heated before we receive them, guaranteeing maximum nutritional benefits. We also make all of our nut butters in-house: almonds, walnuts, and cashews are exceptionally nutrient-dense, and full of healthy fats. And, they’re loaded with antioxidants, high in Vitamin E and magnesium, and assist with blood-sugar control and blood pressure levels. We hand-zest and grate our ginger, which is a rich source of nutrients and bio-active compounds that positively affect the body and the brain. Full of antioxidants, ginger is a powerful anti-inflammatory and also aids with digestion. Our Michigan Montmorency tart dried cherries have no added sugar, juice, or oil. They are rich in antioxidants and have anti-inflammatory properties. All of our seeds are hand roasted, without oil or salt. Flax, sunflower seeds, pepitas, and sesame seeds are some of our favorites. They contain healthy fats, fiber, iron, calcium, and magnesium that help to boost energy levels and prevent hypertension. We use only unsulphered, unsweetened coconut and hand-roast ourselves. We make our own Coconut Butter to ensure the purest and freshest butter possible. We hand-zest and juice all of our lemons. Lemon promotes hydration, digestion, and is an excellent source of Vitamin C.
Our oats are non-GMO and gluten free. Oats are particularly good for heart-health, in addition to containing antioxidants. Eating oats helps to spread the rise of blood sugar out over a longer period of time, which helps to prevent sugar spikes and crashes.